v5: My CD/DVD Rescue Media will not boot. Home » Knowledgebase » Rescue Environments » Troubleshooting » v5: My CD/DVD Rescue Media will not boot. This article explains how to diagnose and fix non-booting Rescue media issues. For brevity, CD will refer to either CD or DVD. Except where stated, it is equally applicable to linux or PE based rescue CDs. The causes of non-booting rescue CD fall into one of two broad categories, either it is an issue with your CD or with your PC. Try booting the CD on a 2nd PC. If it boots, this indicates a configuration or hardware issue with your PC. Please see Verifying your PC later in this article. Try a different brand of CD media. We have found that CD recordable media is of variable quality. Often, using different media will resolve your issue. Try creating the rescue media on a 2nd PC. If Reflect is installed on the 2nd PC, please try creating rescue media there. Alternatively, following the same CD creation steps as before, select Create ISO image file on the last page of the wizard. Transfer this to the 2nd PC and us a third party utility such as ImgBurn to burn the CD. In each case, try booting the 1st PC with the new CD. Note: Booting from DVD and CD can take a while due to the time to load the large boot image, CD in particular can take up to 5 minutes. Unfortunately, on some hardware PE 4 does not show a progress bar during the loading period. Therefore, with a PE4 CD, please give the media chance to finish loading before concluding that it is not bootable. To boot rescue media from CD, your BIOS or UEFI firmware must be correctly configured and have hardware suitable for booting. Please try as many of the following steps as possible to diagnose this. Note that there is no standard for motherboard firmware configuration, so our instructions are necessarily non-specific. Please consult your motherboard manual for details relevant to your PC. Try booting a Microsoft Windows install CD. If the boot fails, this is indicative the your hardware is incorrectly configured. Please continue through this list for further diagnosis. Invoke your BIOS/UEFI boot menu. 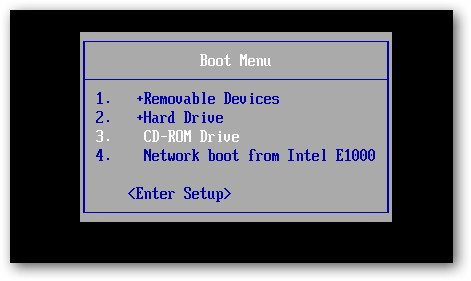 Boot menus vary in appearance and are invoked in different ways. You may need to refer to your motherboard manual to find the key combination to access this. Sometimes, this is displayed on the screen and is usually a key such as DEL, F8, F11, F12, F2 etc. You are able to boot your rescue media in this manner, but not without performing this step. In this case, please see the next step in this section. You are unable to boot your rescue media having seen the hardware in the menu. In this case, you may wish to try the Verify CD steps above. If these do not rectify the issue, your hardware may not support booting Windows PE (you can also try this with the Windows Install CD to verify). In this case, please try an alternative rescue media format such as USB, or attach a different CD/DVD drive to the system. You are unable to see the hardware in your list. In this case your firmware has not recognised the device and it is not supported for booting. Change the motherboard boot order. Please enter your BIOS or UEFI firmware setup utility and navigate to the "boot order" or "boot menu" equivalent screen. Please ensure CD/DVD booting has a higher priority than your hard disk, which may be labelled ATAPI, SATA, SCSI or various other labels depending on your system. Please press F10, or your equivalent for "save and exit" to reboot the system with the new priority. Please note that some UEFI firmware may not have boot priorities for removable media, or booting from removable media may be a configurable option that you must enable. Create a USB rescue stick. Follows the same steps as used when creating a CD, selecting instead "USB media" on the last page. If this works and your have verified your CD, it is indicative that your hardware cannot boot a CD. However, a usb stick, is just as functional as a CD, so we recommend you use this as your rescue device. Note: This is only available for PE rescue media. For BIOS/MBR systems, in general, a PC with boot either a 32 and 64bit PE. For EFI systems, the PE architecture must match the system type. A 32bit EFI CD will only boot on 32bit EFI systems and visa versa. Apart from a few tablet devices, all EFI systems are 64bit only. What to expect when booting rescue media. The PE 3.0 environment is based on (a cutdown version of) Windows 7 and so boots in a similar fashion. The PE 4.0 environment is based on Windows 8 and so boots in a similar fashion. The PE 5.0 environment is based on Windows 8.1 and so boots in a similar fashion. You may notice a lag during boot on CD/DVD rescue media whilst the WIM is copied into memory. This can take some time, so please be patient. PE 4.0 and 5.0 media on UEFI systems may additionally display no progress bar during initial load, so please be patient if you have a blank screen. Article has been viewed 14,178 times.